The North/South Metro Line in Amsterdam, widely regarded as one of the most challenging infrastructure projects in Dutch history. Watch the video to see the techniques used in the construction of the North/South Metro Line. During the design phase, the contract preparations and the supervision of the performance of work, the joint venture of TEC (Witteveen+Bos and Royal HaskoningDHV) and Ingenieursbureau Amsterdam collaborated on the project in a consortium called Adviesbureau Noord/Zuidlijn. The North/South Metro Line will help to combat traffic congestion and is expected to reduce car usage in the city centre – both key objectives of the city government. A key precondition in the design phase was the requirement to retain the historical character of Amsterdam’s city centre. At the start of the project in 1994, this meant that the underground metro line could only be realised if conventional construction methods were applied in a very creative manner. 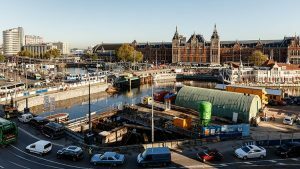 Existing methods such as bored and immersed tunnel construction and pneumatic sinking of caissons have undergone radical innovation to suit the unique circumstances prevailing in Amsterdam. By developing these innovative methods, the Dutch engineering and construction industry has now gained an even stronger leading position in underground construction, both domestically and internationally. The North/South Metro Line is a complex project characterised by budget overruns, delays, difficulties in the political decision-making process and problems during construction. These issues sometimes eclipsed the wonderful technical achievements realised during the project. The completion of the line is a good occasion to highlight the feats of engineering that made the North/South Metro Line possible. Below the retrospective interviews with two founders of Adviesbureau Noord/Zuidlijn: Hans de Wit, managing director of Tunnel Engineering Consultants (TEC) and a project director at Royal HaskoningDHV, and Frank Kaalberg, leader of the Underground Infrastructure PMC and senior consultant at Witteveen+Bos.